"What is it in France they say? 'America contributed three things to culture: jazz, musical comedy and comic books.'" You can already buy two on iTunes. And if things pan out, you'll be get the third on the Apple tablet. Over the last few weeks I've been talking to people within the comics industry to try to sniff out Apple's plans, including Neal Adams, developer of an upcoming motion Astonishing X-Men comic on iTunes, who also told me the French saying. Everyone in Adams' line of work is buzzing about the tablet and what it can do for their masterpieces. I'm pretty sure that Apple is entering into a formal alliance with LongBox. When I asked [LongBox CEO Rantz] Hoseley about what kind of partnerships the company is forming, he spoke vaguely of what was taking up most of his time at the moment: a lengthy and complicated agreement with a seriously large company operating in the media space. One problem: Several sources I spoke to over the last couple of weeks, including top-level executives at giants like Marvel and DC, have said they've not heard a whisper from Apple—despite a nearly desperate hope that Apple would come a-courtin'. One executive said to me, when I mentioned the possibility of putting his comic books on the Apple tablet, "If you've heard anything from Apple, please tell them I'm ready to do it." 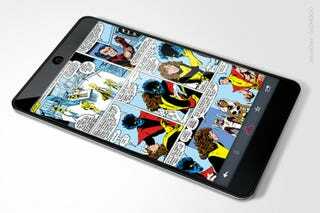 That means that LongBox may be the only distribution option for comic books at the tablet's launch, through some sort of dedicated LongBox app. And if LongBox's distribution plan for the Apple tablet is just an app, why would they need to do any negotiations with Apple? Launch the LongBox app, sell the content, and go. No Apple nod necessary. We know that Apple has been reaching out to select publishers. It was Andy Inhatko who passed on the rumor about "trucks loaded with books" earlier this year. It all fits with the moves we already know Apple is making in its outreach to magazine and newspaper publishers. For Apple, the tablet is about cleaning up; with the addition of books, newspaper, magazines and comic books, there isn't a single vector of mass media that Apple won't be able to distribute through iTunes. With the success of the App Store—a success I think even Apple wasn't expecting to such a degree — they're even a major distributor of software and games. Oh right, there's also music and video. Marvel content, especially, seems like a given. Disney bought Pixar, putting Steve Jobs on the Disney board. Then Disney buys Marvel. Marvel has already dabbled in publishing content through iTunes, with a new "motion comic" version of The Astonishing X-Men hitting iTunes on October 28th. I spoke to Inhatko on my tiny Apple tablet last week about his story. He's increasingly persuaded that Apple is content to let print publishers distribute their content through apps, not through the iTunes store itself. Could just be wishful thinking on my part—I'd rather manage subscriptions through iTunes like podcasts, rather than individual apps—but either way it's a win for Apple, who will happily get their cut no matter what system of digital print distribution ultimately takes off. If you have any leads on comic book tablet activity, by all means, send us a tip. There is one shocker I discovered in my discussions with Marvel folk: It's been confirmed to me that Hulk is stronger than Thor. Chew on that one for a while — at least until you can buy Hulk vs. Thor on iTunes. Excelsior! Joel Johnson has a blog, but your best bet may be to follow him on Twitter @joeljohnson.